Jane, I use a very similar recipe…often! I also try to put in some zucchini and or celery to bulk up the vege content without changing the flavours too much. I have used good quality sausages in place of chicken which works especially well with the sun dried tomato combo. Providing the stock powder is gluten free, then this dish is a great GF freindly meal too. Love the blog! I am making the chicken pie tonight!! Great ideas, Alice. Thanks for sharing. I am keen to try this with chorizo sausage and peas… so many possible combinations! Sorry to be so dense, but can I ask what you used to mould the rissotto to make such a lovely mound in the first picture? I’m guessing just an ordinary cup but…..
Hi Deb, I just used a small ramekin. This shaped one is relatively easy to come by in a kitchen shop for a couple of dollars. So I made this dish last night. It was delicious – or at least my husband and I thought so. Little people aged 8, 6 and 3 disagreed. Two tasted it, pulled faces and declared they would eat none of it while the other self-righteously lectured them about being grateful for the food mum made them (before refusing to even taste it herself). Still, I thought it was delicious and in about 100 more times of offering it, I’m sure the clan will come around. But I do need to ask another dumb question. 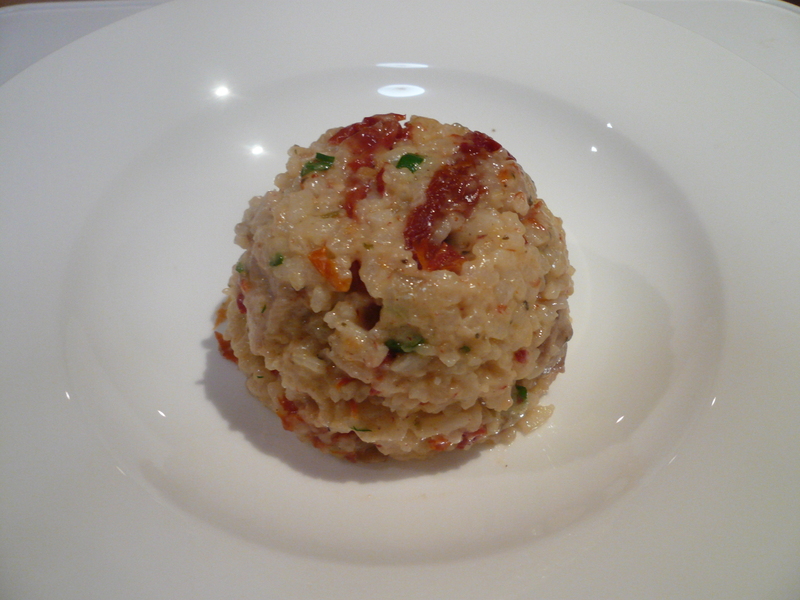 I could not get my risotto to stay “moulded” in that nice shape when I went to get it out of the ramekin. Was my mixture too wet or is there some technique I’ve missed by not watching enough TV cooking? Give us a tutorial, please! Hi Deb, Glad you and your husband enjoyed it- hope the kids come around eventually! In terms of moulding the risotto in a ramekin, this is what I do: I pack the ramekin full and tight, flattening it out with a spoon. Then I turn the ramekin over on top of the serving plate and let it sit there for a minute so that gravity has a chance to help. After that I usually find that it’s just a few taps and it comes out. If that fails, you could try spraying the inside of the ramekin mould with just smidgen of olive oil spray before loading it with risotto, and that should work I would think. Good luck!